You would be surprised how much you actually feel once your home is decluttered. Clutter has its name because it actually clutters your mind, your spirit and your life. Free yourself and start with those easy and simple Tasks for a Month of declutter. Most things can be done within Minutes and attached is a Printout sheet for you to check off what you have done. Depending on the work load of the day you might want to switch dem around. 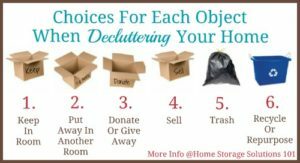 Checklist 1 month of declutter as a PDF for you to print. ← Parenting is a lot about selling things right!